The place to buy Hand Crafted Old Fashioned Soap. Read my story here. Prairie Kari Products are all natural. They are pure and mild with no chemicals, detergents or preservatives to cause skin reactions. No artificial colors are used. People think of lye soap as harsh, but that is an old wives' tale. Lye soap is very mild --all the lye is used up in the process of making soap-- leaving a mild, glycerin-rich soap that is excellent as a bath and face soap, for shaving and for treating laundry stains. Many people find it works well in treating poison ivy, psoriasis, eczema and dry itchy skin. 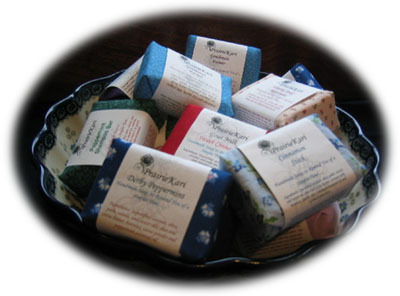 Prairie Kari soaps are handmade, hand poured and are wrapped in fabric so they are perfect for gift giving. Each bar weighs approximately 3.5 to 4 ounces. Prairie Kari Goat Milk Soap incredibly mild. Many people find they do not need lotion when they use Goat Milk soap.